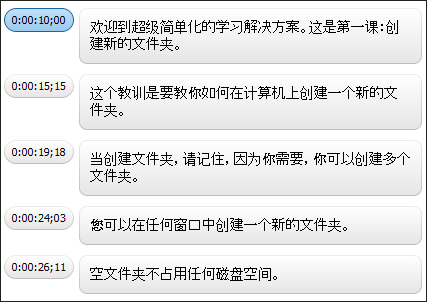 By default, RoboHelp uses the first characters of your topic to automatically create these summaries. As you can see in the example above, the automatically generated search summaries do not give a useful description of the found content. With RoboHelp 2015, you can provide custom search summaries through the topic comments. To set the search summary, open the topic properties and go to the Status tab. Fill your custom summary in the Comment field. 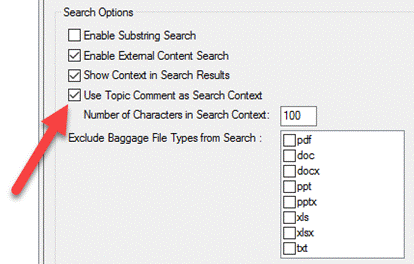 Select Use Topic Comment as Search Context. Save and Generate the output. 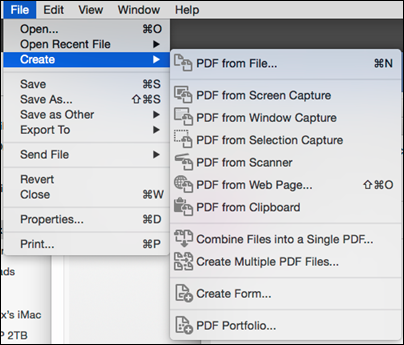 In the first article in this series, we discovered all the ways to create PDFs. Now that I have a PDF that I want to convert to a form, I am ready to add text fields. 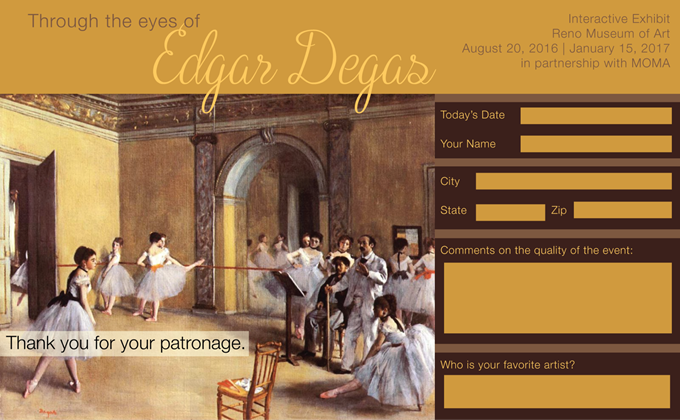 As you'll recall, I created a postcard-sized PDF in Adobe Illustrator that I want to use for my form. I added shaded boxes where I want the text fields to be. I want to emphasize you can do what I am about to show you with a simpler form--for example, one you created in Word with just text and no images. I will show you how to do both in this series. Notice the vertical list of categories on the right side of Acrobat. I chose Prepare Form (which took me to a screen where I could select the PDF to convert to a form). I usually have the PDF I want to convert open when I do this step, but you can always browse and find the document if necessary. Acrobat can detect fields for you, specifically in Word documents. It does an excellent job of detecting where the fields should go. However, I create a lot of documents in Illustrator or other applications that are design-heavy. Acrobat does not do a good job with automatically detecting fields in those types of documents. In that case, I tap Change hyperlink and turn off Form field auto detection. Then I create the fields myself. At the top of the document, there are Form Fields and other Form tools. 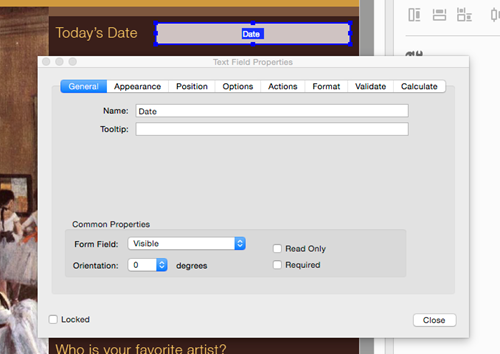 I chose the Add a Text Field tool, clicked and dragged across where the Date field is on my form. Because I have a shaded box in place, I chose to make the field transparent. Once I've added the field, I name it, and tap Properties. Here's where I can change settings for the text field. Note: Always name your fields. When someone submits the form data to you by tapping the Submit button, the info returned is "Name=Value." If you don't name your fields, you'll receive "Text Field 12=Yes" and you won't know what the question was. Name your fields. Text Field Properties - General allows you to name the field, add a tool tip (always a good idea, and for accessibility), and show other options for visibility. Text Field Properties - Appearance allows you to add or remove Fill and Stroke to the field. Here, I have chosen to remove both and keep it transparent. I also can choose Font, Size and Color for the text the user will enter. Text Field Properties - Position allows you to exactly position the field. I skipped over that and went to Text Field Properties - Options. Here, I set the alignment, any default text I want to appear in the field and set options for the text. One idea is to check multi-line if your question might involve a lengthy answer. Or you can limit the number of characters, such as an account number. Text Field Properties - Format is where you can choose things like zip code, Social Security number or in this case, date. For this example, I'm skipping over Text Field Properties - Actions, Text Field Properties - Validate and Text Field Properties - Calculate. Here is what the text field looks like when I am in edit mode. If I preview it, I will be able to see the field is transparent. 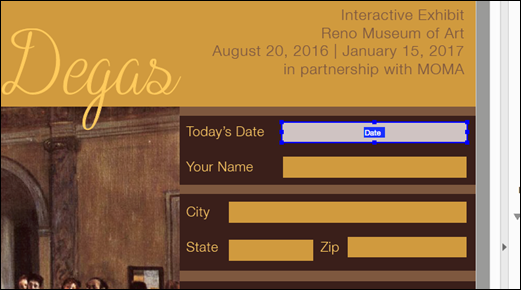 And here is the postcard with the text field in place. I have previewed it and entered type to see what it looks like. If the text seems too big, I can edit the Appearance tab in the Text Field Properties. Next time: Drop-down menus and adding a Submit button. 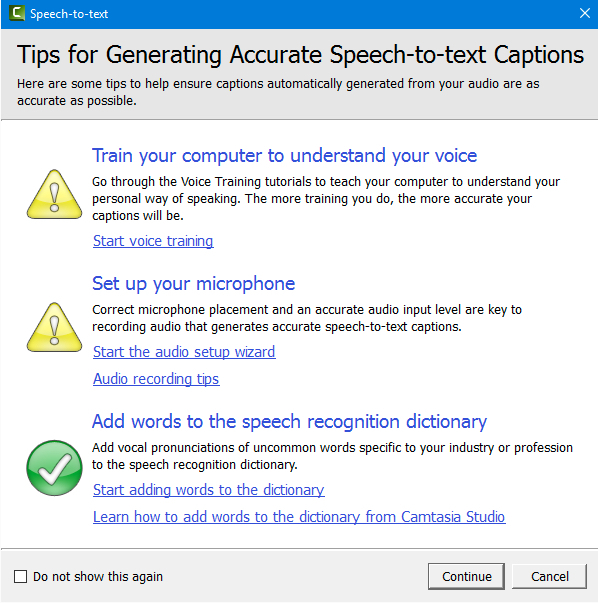 Last week I wrote about the process of adding closed captions to Camtasia projects that help make your project accessible to learners with disabilities. During a recent Camtasia class, a student asked about providing the captions in other languages than English (she was asked to create versions of her project in a dozen languages). Localization of an eLearning project can present a tough challenge to any developer. Fortunately, it's fairly easy to convert Camtasia captions to different languages. Here's how. In the image below, notice that I've already added the closed captions to my project. After adding the captions, I ensured the captions and the voiceover audio were synced via the Timeline. At the bottom of the Callouts panel, I clicked Export captions. In the image below, I've opened the SRT file in Notepad. Then I replaced the English text with Chinese. (I used Google Translate for this test so if you speak Chinese, please forgive any errors.) When replacing the text, I was careful not to mess around with the numbers above each caption. Back in Camtasia, all that was left to do was to click Import captions and open the SRT file I had translated. And in an instant, all of the captions were translated to Chinese. Perhaps more important, the synching work I had done on the Timeline was retained. If you'd like to watch a video that demonstrates the process of localizing Camtasia callouts and importing/exporting, here you go. Looking for Camtasia training? Check out this live, online class. Closed captioning (CC) allows you to provide descriptive information in your published eLearning project that typically matches the voiceover audio contained in your Camtasia project. There are a couple of ways you can add closed captions to your project. During this post I'm going to show you how you can add the captions manually (by typing or copying/pasting from an existing script), and how to have Camtasia transcribe the voiceover audio using the Speech-to-text feature. In the image below I've opened a project that already has audio on the Timeline. If you'd like to listen to the audio and transcribe what you hear, click the Add caption media button. You can then press [enter] to listen to the voiceover audio and type what you hear. When finished, press [tab] and [enter] to create another caption. If you don't have the voiceover script and you're not a fan of typing, check out Camtasia's Speech-to-text feature. To begin, bring up the Captions panel as if you were going to add the captions manually and then click Speech-to-text. The Tips for Generating Accurate Speech-to-text Captionsscreen offers some awesome tips on making the process as smooth as possible. Click the Continue button and Camtasia will scan your project and transcribe the audio for you. While I found the Speech-to-text feature to be awesome, it was a bit hit or miss. For example, the first caption you see below ("The if the if the left half the") was actually background music. I have no idea why Camtasia attempted to transcribe it, but the results were just a tad off the mark considering there were no lyrics at all. The second caption was a fair attempt, but there were several typos. The third caption was actually quite good. Getting rid of the unwanted caption is no problem. Simply right-click and choose Delete caption text. In the images below, you can see the significant edits I needed to make to the second caption. Nevertheless, I found it faster to edit the caption as opposed to typing it manually. And in the following two images, you can see how little editing was required to get the caption ready to go. 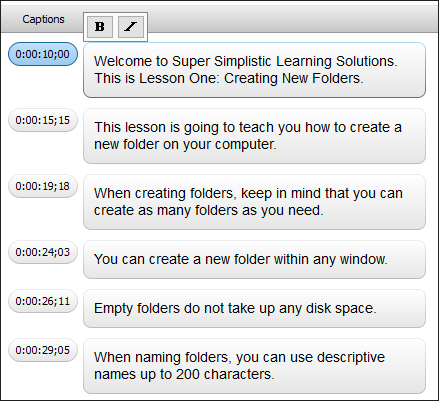 And in the image below you can see how the second caption appears in my produced eLearning lesson as a closed caption. If you're like to see a video of the process of manually adding closed captions to a Camtasia project, check this out. PDFs are everywhere, and forms are still one of the most popular PDF types. Whether you are creating a form from scratch or updating an existing one, I bet I can show you a few things you didn't know about PDF forms. This is the first in a series of articles that I'm planning on building and getting creative with PDF forms. Let's get started with the PDF form creation process. 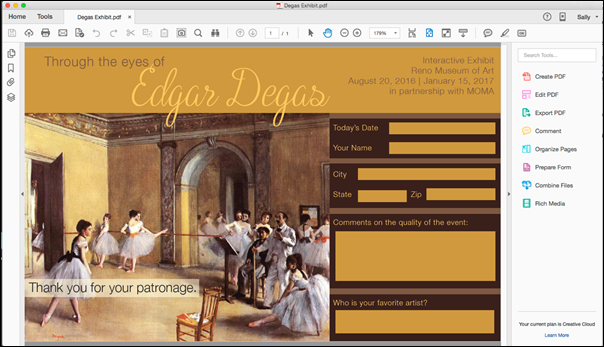 Regardless of which application you use to create the initial document, you can make it into a form in Adobe Acrobat. Keep in mind that if you can print a document, you can usually create a PDF. I use Adobe Illustrator to create my documents and then I save them as PDFs. When it comes to form fields, I add them in Adobe Acrobat (see my example below). I use Microsoft Word to create the document, and Acrobat can detect and add form fields for me (see example below for this one, too). We will review both those methods, but let's start with using Word to create the document. These are examples I will use throughout this article series: at the top, I simply typed my text in a Word document and exported it to PDF. Above, I took the same information and created a postcard with colored boxes where I want the text fields to go. I can add and customize form fields in Acrobat. To create a PDF with Word, you either print to PDF or import a Word document into Acrobat, (which automatically creates a PDF). In the example below, I set up a simple Word document. To print to a PDF, choose File > Print. 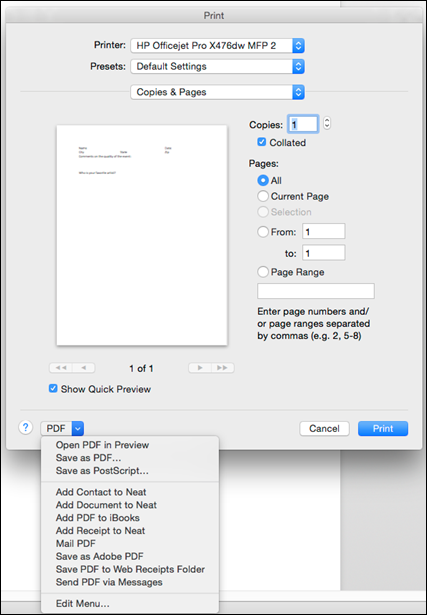 Then choose Save as PDF from the menu in the lower left of the dialog box. Create the Word document and save it. Open Acrobat. 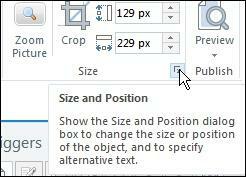 From within Acrobat, choose File > Create > PDF from File. This will allow you to browse and find the document you wish to convert to PDF. You can convert Microsoft Office documents and most image formats using this method. I happen to be a heavy Illustrator user so I will show you an example of how that same form information could be used to create a more visually appealing form. This is the Illustrator document I created using the same form questions. In a future article, you will learn how to create text form fields in Adobe Acrobat and drop-down menus. To save an Illustrator document as a PDF, choose File > Save As > Adobe PDF (pdf). Next time: Turning the PDF into a form, adding form fields and learning to love the Button Tool! Allowing a learner to use the keyboard to navigate around a published Adobe Captivate project is a large part of ensuring that your project is accessible (you learn about accessibility and Section 508 compliance during our live, online, 2-day advanced Captivate class). However, if you've added a Table of Contents and/or a playbar to your Captivate project, you might want to ensure that only slide items can be accessed via tabbing. As an experiment, add a TOC to a project (via Project > Table of Contents), publish it and view it in your web browser. As you press the [tab] key, you'll notice that you can go down the TOC and then across the playbar. Back in Captivate, display the Publish Settings dialog box via the File menu. 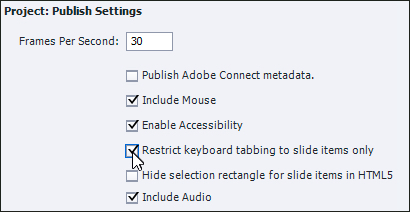 Select (check) Restrict keyboard tabbing to slide items only. Republish the project. This time when you [tab] through the lesson, the TOC and playbars are not accessible, but screen objects are. Note: If you publish the project as HTML5, the learner will end up in the browser's Address bar after all of the slide items have been tabbed.